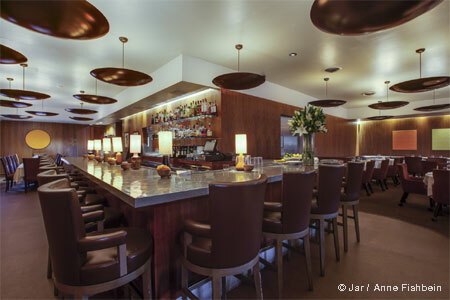 Colorful, whimsical setting for a fusion of Asian and French cuisines. : Chinois on Main, Wolfgang Puck's second restaurant (after the original Spago), has been a quintessential L.A. classic since the day it opened in 1983. Its once-bold concept of fusing Chinese and French cuisines ushered in a wave of Cal-Asian eateries that has yet to subside. But this restaurant continues to be an enduring favorite and is invariably crowded (and noisy, we might add). The colorfully whimsical design of Puck's then-wife Barbara Lazaroff has been slightly toned down, but it’s still not particularly comfortable, and we would suggest avoiding Chinois if quiet conversation is your mission. Signature appetizers include warm, sweet curried oysters with cucumber sauce and salmon pearls; stir-fried duck spring rolls; tempura ahi sashimi in a fresh, beguiling uni sauce; and, of course, that addictive Chinois chicken salad. As for entrées, try the whole sizzling catfish with ginger and ponzu sauce or the Shanghai lobster in a spicy ginger-curry sauce, accompanied by crispy spinach. Don't miss the Chinois dim sum dessert box filled with such exotic goodies as almond and plum teacakes, passion fruit cheesecake, lychee sorbet, ginger crème brûlée and roasted pineapple. The wine list runs pages long, and is packed with many fine California picks (leaning heavily toward Napa), but you won’t want for French Burgundies or Bordeaux either. There’s also a full bar. 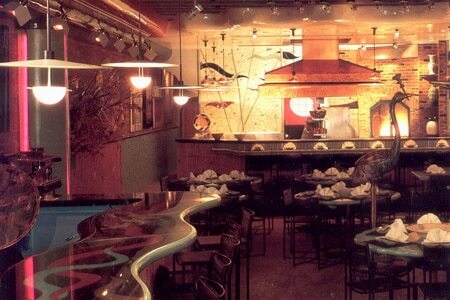 All-in-all, with its cheerfully chaotic mixture of pan-Asian flavors and Hollywood sensibilities, it's not an exaggeration to say that if you haven't been to Chinois, you've not only failed to fully explore the talent of Wolfgang Puck, you've failed to fully explore what it means to dine in Los Angeles.